As in the last few trips we have made to the Somme, we took the Dover - Dunkirk ferry, allowing us to stop of in the Ypres area on the way down. This year, we concentrated on some of the cemeteries and German blockhouses in the Pilckem Ridge area. As anyone who knows Ypres, the so called "ridge" was merely a slightly higher bit of ground, but as such, in this flat country of huge tactical importance. On 31st July 1917, the opening day of the Allied Offensive in this area, the British made good progress to the right of the Ypres-Roulers road which formed the axis of their advance. The German lines were penetrated to a depth of nearly two miles, with bridges over the Steenbeek secured. Several villages were captured, including St. Julien and Pilckem. 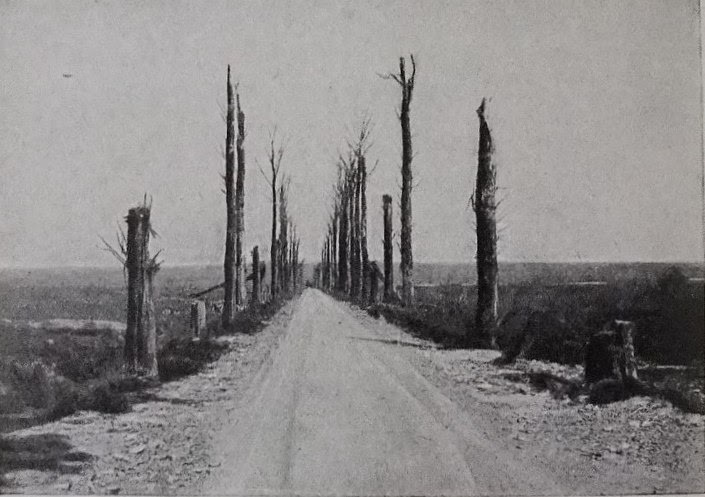 To the left of the Ypres-Roulers road the British encountered more resistance, perhaps due to the more broken and wooded nature of the country which allowed the Germans to maintain points of resistance. This post is just some of the cemeteries and blockhouses we visited. Each one starts of with an image taken by Sidney Hurst for his book "Silent Cities" and my attempt to reproduce it today! The text from "Silent Cities" for each cemetery is also reproduced. 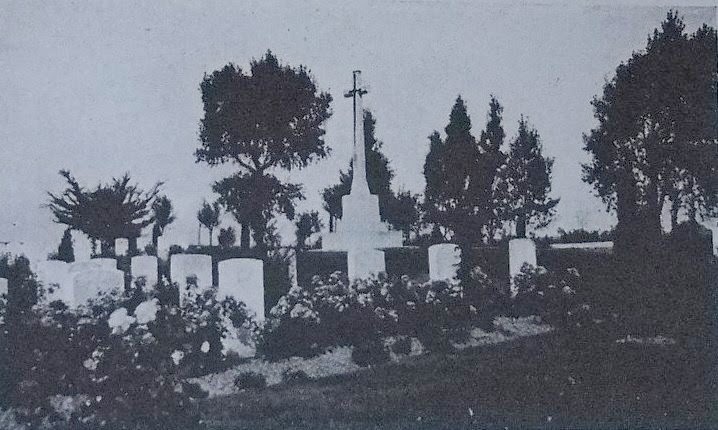 ABOVE: LA BELLE ALLIANCE CEMETERY, BOESINGHE (W. FLANDERS). 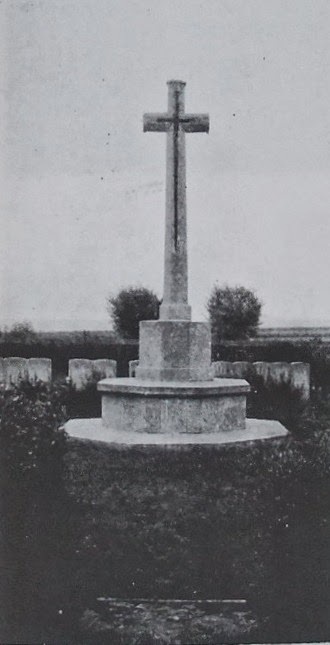 2 ½ miles N of Ypres Sta. La Belle Alliance Farm us E. and S. of Boesinghe, near the W. end of Buffs Road. Cem. is near SW. corner of farm and was made in Feb. and March 1916 by the 10th and 11th K.R.R.C. Records 60 U.K burials. 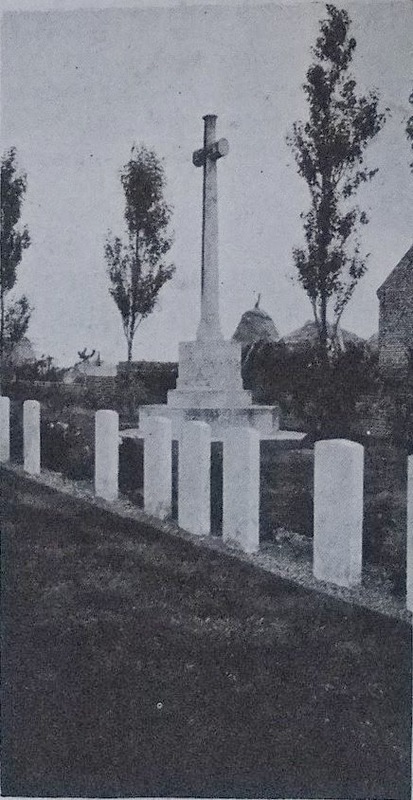 ABOVE: DIVISONAL COLLECTING POST CEMETERY AND EXTENSION, BOESINGHE (W. FLANDERS). 1 ½ miles N. of Ypres, E. of Yser Canal. Begun Aug. 1917 by 48th (S. Midland) and 58th (London) Divs. Cem. records 86 U.K. and 1 German Burial. The Ext. made after the Armistice from battle-field of Salient records 493 U.K., 102 Aust., 73 Can.,5 N.Z., 2 Newfld., 1 S.A. burials and 2 special memorials. 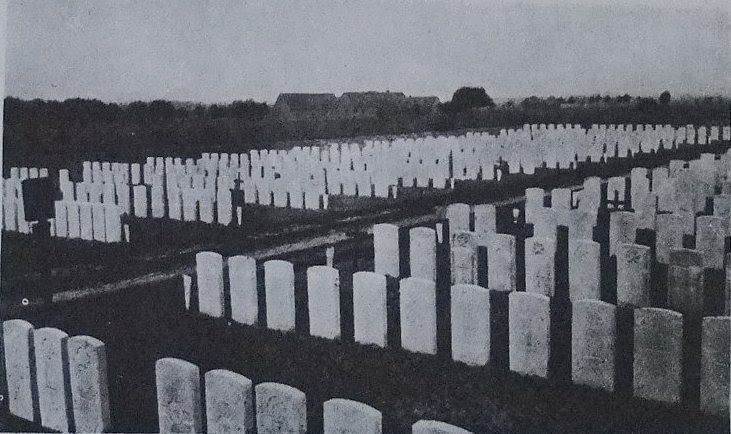 ABOVE: COLNE VALLEY CEMETERY, BOESINGHE (W. FLANDERS). 4 miles N. of Ypres Sta., SW. of Caesar’s Nose, near Boesinghe- La Brique road. Begun by Territorials of W. Riding Regt (49th Div). Records 47 U.K burials. 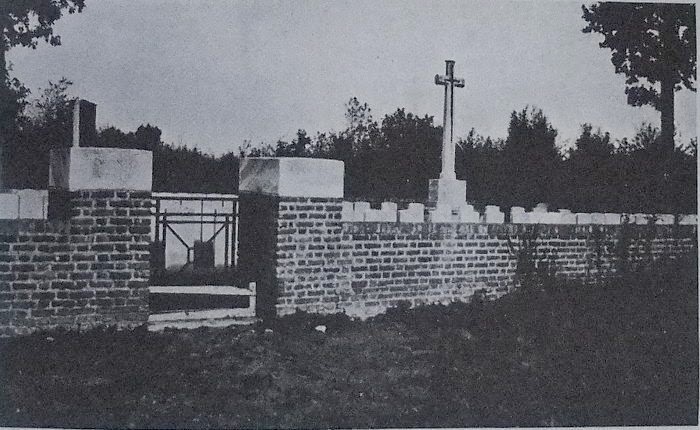 ABOVE: MINTY FARM CEMETERY, ST. JEAN – LES – YPRES (W. FLANDERS). 3 ¾ miles NE. of Ypres Sta. on road to St. Julien, 1 ½ miles N. of St. Jean village. Farm was used as a German blockhouse, and in 1917 as a British Co. Hdqtrs. Records 188 U.K., 4 Unknown and 1 German burials. ABOVE: WELSH CEMETERY (CAESAR’S NOSE), BOESINGHE (W. FLANDERS). 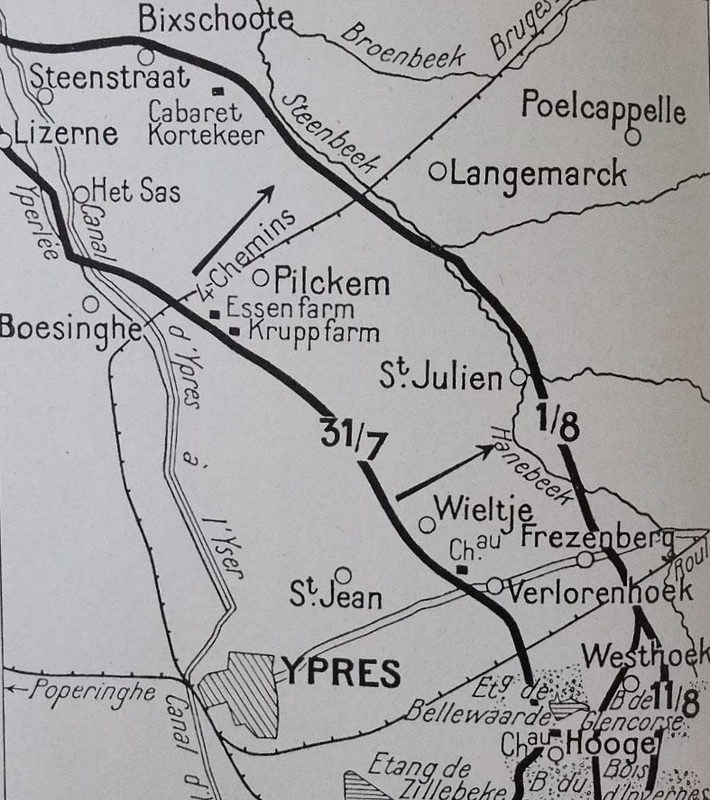 4 miles N. of Ypres Sta., near crossing of Ypres-Pilckem and Boesinghe-Wieltje roads. Began July 1917 by 38th (Welsh) Div. at a spot then known as Caesar’s Nose. Records 62 U.K. and 6 unknown burials. ABOVE: Supposedly the largest German blockhouse in the Ypres area - it was used as a signal post. ABOVE: A small blockhouse but it had incredibly thick walls! ABOVE: A small shelter or perhaps field gun emplacement? Possibly work carried out on it by the British after its capture as some entrances etc seem to have been blocked up. The intention was to also visit Ploegsteert Wood, passing along the Messines ridge, but we just ran out of time, only managing three cemeteries and the Chateau de la Hutte. Maybe we will have time to visit again on another trip!! ABOVE: Not exactly a then and now - the top B&W image shows the Messines Road at the Chateau de la Hutte with the Messines ridge in the background. The bottom image shows the Messines ridge from the site of the ruined Chateau today, the Messines road can be seen in the far right of the image. 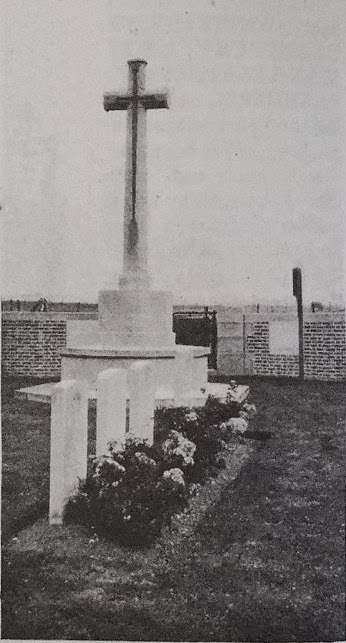 ABOVE: PROWSE POINT MILITARY CEMETERY, WARNETON (W. FLANDERS). 300 yards N. of Mud Corner, 1 ¾ miles from La Basse-Ville Halte, and 9 ½ miles to Ypres Sta. Was named after the late Brig.-Gen. C.B. Prowse, D.S.O. Records 159 U.K., 42 N.Z., 13 Aust., 1 Can., and 12 German Burials. ABOVE: TORONTO AVENUE CEMETERY, WARNETON (W. FLANDERS). 10 ½ miles from Ypres, 2 miles from Ploegsteert, near N.E . edge of Ploegsteert Wood. Begun by 3rd Aust. Div. during battle of Messines, June 7th – 10th 1917. Records 78 Aust. burials. A concrete shelter can be found nearby. ABOVE: MUD CORNER CEMETERY, WARNETON (W. FLANDERS). Near R.Lys. On N. edge of Ploegsteert Wood, 2 miles from La Basse-Ville Halte. Used from June 7th (when N.Z. Div. captured Messines) to Dec. 1917. Records 53 N.Z., 31 Aust., and 1 U.K. burials. Third and forth image are a then and now of a view taken just after the cemetery was started. Another visit to the Somme with my brother this March, with some good finds in the fields. Nearly 100 years on, the so called "Iron Harvest" of relics never ceases to amaze me. These are only the things that turn up on the surface, what must be lying a few feet deep?? A British rifle grenade, that someone has hung up in a bush, like a strange Christmas tree decoration! Back of Mouquet Farm. German egg grenade, still showing black paint finish. This is the later model with the serrated band around the grenade, improving the throwers grip. Serre. Relic British SMLE Rifle, found Leipzig Salient. Two images of a German 77mm shrapnel shell. Montauban. Two images of a remarkably well preserved British Mills bomb, Ovillers. British 18pdr HE shell with a No.106 fuse. The No.106 fuse was much more reliable than the No.101 fuse, so unusual to find one of these intact! Two images of a Royal Canadian Regiment shoulder title, Courcelette. The RCR were in the Courcelette area during Sept/Oct 1916 and were involved in the fighting for Kerona and Regina Trenches on Oct 8th 1916. They secured most of their objectives but could not hold them as the troops on either flank were unsuccessful. Note that some of the cloth still survives. "LONDON" shoulder title from one of the battalions, 47th London Division, involved in the attack on High Wood, Sept 15th 1916. British 4.5" Howitzer HE shell, with High Wood in the background. British 18 pdr HE shell and two 3" Stokes mortar rounds, with High Wood in the background. British 4.5" Howitzer HE shell and German 77mm HE shell. Above: A German 77mm gas shell with Trones Wood in the background. The bottle is an example of a one for a 77mm shell which contained the gas in a liquid form, placed inside the shell. Oil bottle for the British SMLE rifle, Maricourt. A collection of German screw pickets and other relics, Boom Ravine. Bottom image shows a German entrenching tool and gas mask filter. Two images of a "The Kings Own" (Royal Lancaster Regt.) Cap badge, Serre. The second image shows the badge on the memorial to two German soldiers and an unknown British soldier from the King's Own found in October 2003. The 1st Battalion Royal Lancaster Regt were involved in the attack on Serre on 1st July. The battalion War Diary notes that as "the advance commenced the Bttn. came under heavy machine gun fire and there seems no doubt that a large number of casualties occurred before reaching or own front line". This badge was found behind the British Front Line. The bottom image shows the grave of of the casualties from the Kings Own on July 1st, Lance Cpl J McNamara, aged 22. Serre was heavily fought over from 1915-1916 by first the French and then by the British. The above image shows a fraction of the remains we found in one field , including a British entrenching tool, handle of a French bayonet, the Kings Own Cap badge shown above, a complete bottle (probably for a paste), German, French and British buttons, British equipment buckles, British, French and German bullets. The field was littered with broken glass SRD jars, complete and fired bullets, shell fuses and cases, hand grenades etc. Clips of British .303 rounds, Serre. Two images of a complete German "Ersatz" bayonet in its scabbard, funnily enough found in the vicinity of Bayonet Trench!! Perhaps the strangest find of the week, a French 75mm shrapnel fuse that has landed straight through one of the rings that made up a British 18pdr shrapnel fuse! !